This blogpost will be divided into two parts. In this first part I will elaborate on the way media affects people’s views and ideas about the thousands of people who are seeking refuge in the EU. In the second part I will address the different ways in which visual images of refugees move throughout the world and the ways those images move us. One thing I have been annoyed by this summer was that a majority of the (news)media has seemingly used the terms migrant and refugee interchangeably in reporting news about the tens of thousands of people who are fleeing their country to stay alive. Noteworthy is that The Guardian and Al Jazeera English both stated that they will no longer use the word ‘migrant’ in reporting news about people who are seeking refuge in the EU. My irritation lies in two issues. One is that the terms have very different legal implications. The second is that the language used in news media are turning the fleeing people into statistics which as a consequence is taking away their humanity. The terms also do not comprehend the complexity of the situation. I think another issue of the use of language here is that the situation is being classified as a ‘problem’. When marking something as a problem it usually becomes something that is annoying, difficult, unmanageable and where people do not want to get involved in. The situation is of course problematic, but labelling it as a ‘problem’ emphasises negative perceptions. The legal distinctions are very important to mention here. A migrant is someone who is moving or has moved in their own country or to another country. From a legal perspective, governments are able to deport people who are a migrant and do not possess legal documentation. [A person] owing to well-founded fear of being persecuted for reasons of race, religion, nationality, membership of a particular social group or political opinion, is outside the country of his nationality and is unable or, owing to such fear, is unwilling to avail himself of the protection of that country; or who, not having a nationality and being outside the country of his former habitual residence as a result of such events, is unable or, owing to such fear, is unwilling to return to it. In contrary to migrants, people with a refugee status cannot, by law, be sent back to the country where their lives will be in danger. Of course there are also migrants on board of those boats and at the borders to seek asylum. However, according to the UN this is only a very small amount of the total of people who are seeking refuge. However, there are discussions about whether or not people who are migrating because of the effects of climate change should be reclassified as refugees instead of migrants. When news media reports that there are “decomposing bodies of 71 migrants found in lorry” or that “200 migrants drowned at sea”, one may imagine that these are all adults. The people who died trying to get to safety, become numbers without any detection of humanity and voice attached to them. The bitter truth is that on these boats are families of men, (pregnant) women, babies and children. The language is thus, in a way, dehumanizing the people who are so desperate that they are willing to risk their own lives and that of their children to be safe from the deadly conflicts in their countries, simply because they cannot see another way out. When finally arriving in a country that is free of war, they are again faced with extreme violence by military and police forces. The wrongful use of the terms (writing only one or the other, when implicating both) in a lot of media reports contributes to prejudices. In our society the words have, generally, negative connotations and are denying humanity to the people who are referred to as such. As I have addressed in one of my previous blogs, in the Netherlands the terms allochtoon, as well as terms like asylum-seeker, have become something else in everyday conversations than originally intended, almost toxic. The terms’ original meanings are replaced by common negative interpretations, which in turn negatively affects perceptions about people who are a migrant or refugee. It sometimes even seems that terms as migrant, allochtoon and asylum-seeker equals bad. While someone from the west who wants to develop his intellect or expand his career elsewhere is almost never referred to as a migrant, but as an expat. The negative perceptions of people who are classified as migrant, refugee or asylum-seeker becomes painfully visible when you read comments about this humanitarian crisis. In these comments a lot of people are calling the refugees ‘fortune seekers’ or ‘filthy animals’. Fortunately there are also people calling these racist people out. What I also mentioned in my blogpost about microaggressions and racism, is that these kinds of discriminating views are mostly rooted in fears of ‘others’ being a threat to Western civilisation and undermining of its culture. In the context of the refugees, there are also concerns of terrorism. In the RTL Late Night special episode on the refugee crisis which aired last Monday, a Dutch TV-host seemed to be stressing and accentuating this fear by repeatedly saying that “we do not know who comes over the border”. In that same episode TV-presenter Beau van Erven Dorens, who was being interviewed about the donations being made during the broadcast, addressed the kinds of “harsh language” used on social media about refugees and stated that he finds it shocking and wishes people would stop. Many of the refugees are fleeing the likes of ISIS in Syria or al-Shabab in Somalia, but no one can preclude the possibility that terrorists have secreted themselves in the flow of humanity. Yet terrorist groups have already shown themselves quite capable of sending agents to Europe — or recruiting them there — through more conventional means. Just as no refugee would brave crossing the Mediterranean or negotiating the land route through the Balkans if easier options were available, so these routes would hardly seem to be major avenues for well-financed terrorist groups. There is no evidence that any has used it. In all the interviews and stories I have read, it becomes clear that most of them consider to be already dead and that they are risking their lives on boats, in, under and up trucks, trains and by foot because they have nothing left to lose. Others want to ensure, or at least try to provide a better future for their young children. As you can see from the photographic storytelling of UNICEF and Human Rights Watch. Doctor Ali, 25, spent four years working in the hospital in Saraqib, Syria. He fled after he witnessed a close friend killed in a barrel bomb explosion dropped by a Syrian army helicopter. He wants to go to Germany and continue with his medical studies. Can you imagine living in a neighbourhood, a city or a village where you see people die every day? Seeing brains and blood streaming out of the little heads of children? And where you are constantly at the risk of being killed, tortured, raped or kidnapped? Wouldn’t you one day decide that enough is enough and risk dying of trying to get yourself and your family to safety, because you might otherwise die where you live now? The current situation is heart-breaking and the number of refugees is even larger than during WWII. 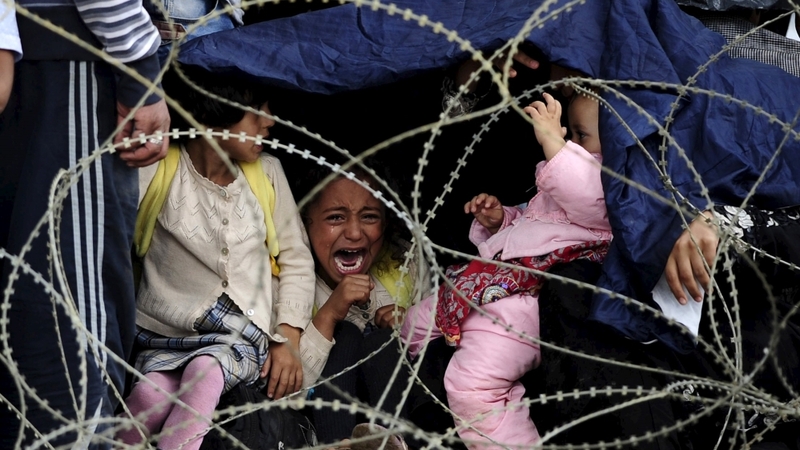 Today, according to the UN, there are 60 million people forcibly displaced by war, violence and persecution. That is 1 in 122 people worldwide. Per day that is 42.500 men, women and children who become refugees, asylum-seekers or are being internally displaced in 2014. 4 Times as many than four years ago. The 380.000 people who are now being kept at campsites around the Greece, Italian, Hungarian and Serbian borders need and should be taken in to countries that can provide a safe home for the time being. The number in combination with the visual images of the ‘flood’ of people we see in the news, seems large but is in reality ‘just’ 0.068% of the entire EU population. In Turkey for example, there are now an estimate of 2 million refugees taken in and in Lebanon there are 1.3 million Syrian refugees who take up about 25% of the country’s current population. There is no lack of means to offer people safety, the problem seems to be one of political nature. To quote Closing borders and removing safe and legal routes empowers human traffickers. In the Netherlands we grow up with a collective memory of World War II. We are taught from elementary school about the importance of May 4 and 5. We are constantly reminded about the importance of what had happened under Hitler’s regime and why we must not ever forget for that we cannot let anything happen like that again. Therefore it is especially astonishing to read and hear xenophobic comments about the refugees who are now seeking refuge in the EU. In particular, because during WWII European the people who were seeking refuge of occupied Europe also found safety in Palestine and Turkey. Would it be different if those seeking refuge now were not Muslim or fleeing from the Middle-East and Africa? My grandmother recently said in reference to her experiences during the Japanese occupation in the former Dutch-Indies: “it is incredible that I have survived all of that horror and trauma”. The people who are now seeking refuge have survived horrific and traumatizing events, have witnessed or endured torture, sexual violence and other terrifying practises. They dream and hope, just like you and I, of a safe home. Please think about the people crammed up in boats, refugee camps, train stations and tents next to roads as people. The lives that has left this earth are human beings, like yourself, instead of ‘just’ migrants, refugees or asylum seekers next time you read a story on this subject. How horrible it is, to know that every day people are dying, when all they want is to be safe and to be able to live. Incredible! Hit the nail on the head with this one. I think you should check out my blog you might be interested! Thank you! I will also read your blog.